[Sugar Cane Equipment] - All the equipment you need to plant and cultivate sugar cane. [Fireline & Forestry Equipment] - From the smallest land owner to the United States Forest Service, we have products for everyone. [Construction, Land Clearing & Industrial Equipment] - Clearing new land or building and maintaining road beds. [Tropical Fruits and Vegetables] - Presently servicing farms in over 35 countries. [Terrariser Master Harrow Guide] All of our harrows and specs at a glance. 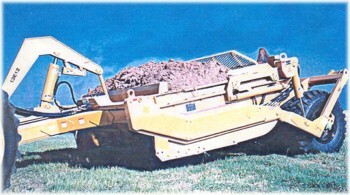 This harrow was designed by Erb & Roberts, Inc. for the Florida Forest Service for use in building and maintaining firelines in the most difficult areas. This heavy duty harrow weighs 3,000 pounds and cuts 7' 6". Click "Read More" for a larger image. New and exciting website features to be added this spring! Erb & Roberts has always been dedicated to bringing you the best quality disk harrows and parts since the day we were founded. We were also the first on the internet in our field and this gives us a strong presence on the world-wide-web today. In the coming months we will redesign our website which will make it easier to use, include more informative contenet, and interactive with the end user. So look for new and exciting things this spring from terrariser.com! We are an authorized Rome Plow Co. Dealer for Earthmoving Scrapers as well as have spare parts for most Earthmoving Scrapers such as Reynolds, Rome Plow and Land Plane. Be sure to call us at 352-376-4888 to get in on new equipment and parts specials on this product! We are running this promotion until the end of February 2006! We are the Earthmoving Scraper experts and can get what you need for far less than the competition, and that's a fact. The heaviest industrial disk harrow for all of your construction and land clearing needs. Welcome to our new News & Announcements system! We here at Erb & Roberts are always improving our product line and also how we deliver that quality to our customers. In this effort we are expanding our website to offer current News & Announcements to keep our customers informed about the latest products and specials. Check back here often as this will update frequently! Note: We offer genuine replacement parts for ROME harrows. These are top-quality, certified part replacements that are true bolt-on replacements. Call us at (352) 376-4888 for more info or visit RomeParts.com for more information. Please feel free to email or call us for any further information or leave a comment below by clicking the "comments" link. Erb & Roberts is a manufacturer of Agricultural Tillage Equipment located in Gainesville, Florida (driving directions to us), in business since 1964. September 1, 1995 brought Erb & Roberts into their new 40,000 square foot production and distribution facility to assist production of the TERRA-RISERTM disc harrow and other tillage product lines. All of the Erb & Roberts product line is utilized in the sugar cane, citrus, vegetable, forestry, cattle, land clearing and construction industries. Specializing in the manufacture of tillage equipment, including tandem and offset disc harrows, disc ridgers and cultivators, subsoilers & furrow and levee plows, the TERRA-RISERTM line is "Making Farming Easier". With one of the largest inventories in the Southeast United States, Erb & Roberts also has an aftermarket distribution division with both U.S. made and high quality, imported disc blades, rotary and flail mower blades, bearings, seals and other spare parts for ground engaging tools to fit all makes of Disc Harrows, Mowers, and other Tillage Equipment. We specialize in parts to fit all ROME Plow Company Disc harrow plows. Free weekly delivery service is supplied to the farms in Florida and the ports of Miami, Tampa and Jacksonville, Florida, USA. All points of the World can now join with the many satisfied farmers of the United States by utilizing the equipment of TERRA-RISERTM Tillage Tools and the engineering services of Erb & Roberts, Inc.
What makes our harrows better? We use the heavy duty Timken Roller Bearing in all our harrows - this bearing provides reliability as well as easy serviceability for the life of your Terra-Riser harrow. Erb & Roberts provides excellent service, not only during but after the sale. Towards this effort, we offer our product manuals and other resources online. Click here to access our Online Resources.